36 hours in Ponds Forge, Sheffield. Or perhaps a bit longer. This week the English National Swimming Championships take place in Ponds Forge, Sheffield. Last year we battled through Sheffield Wednesday supporters to just about see my daughter’s friend get gold. We were both overwhelmed by the experience – the noise, the number of spectators, the commentary, just the whole size of the place. It was different to any gala we’d ever been to. It’s been her goal for a year to get here, but I’d say it’s the culmination of 4 years. 4 years of training first 4 times, then 5, then 6 a week. Of dashing home from school to check her phone, do her homework, gobble evening meal 1, and go to the pool – to return home to check her phone, down a pint of milk, and gobble up evening meal 2. 4 years of turning down chances to go out with school friends, and probably turning down friendships there too, but 4 years of bonding with other swimmers at the club who just get what drives her. Toughest of all, so far, was jettisoning art GCSE as the other swimmers say ‘it’s never done… you don’t have the time to do the best you can’. Last night I sat in the car, windows open, outside the house, listening to Springsteen’s Rocky Ground. I’d just been at our first ever community clean up at the lido. Donning rubber gloves, a vicious scourer and a lot of disinfectant I’d taken on the ladies’ changing cubicles whilst others got going with paint brushes. Come 8.30pm we finished our pizzas and took to the water. Heaven. A 60 x 26m lido available for free play – no lanes, no widths or lengths to swim, just lots of jumping in and floating and looking at the clouds above. And lots of thinking about my girl and her trip to Sheffield. Driving up felt like a real adventure. I’m not sure which of us was more excited – particularly not as we get to stay in a hotel together – or more relieved to have got rid of the car. The boys are joining us on Friday – a 6am train for them with secret bars of chocolate hidden in a washbag to see them through the early start. People think as my twitter handle is @loveswimming and I rant on about galas I must be a pro – I couldn’t be further from it. I might have an itch about and an obsession with swimming the Channel but I’ve not had a swimming lesson since the age of 13… I’ve not got the grim determination either that she has in bag fulls. It’s going to be odd come Friday morning. For 4 years I’ve waited til she looked across at me on the level, gave a thumbs up and then got on with being on the blocks, and then more recently as she’s more serious, waited for her to glance over at me with my officials’ kit on, for the discrete ‘good luck’ nod. On Friday I’ll be up in the stands, far away from her, and out of focus. Far from her for the after race damp hug. Sheffield itself is awash with long limbed teenagers striding around with their mums scuttling to keep up. Like locusts they descend upon hotel buffets (‘3 croissants for now plus 2 for later in case I get hungry’)… Wagamama, Pizza Express. There is some serious carb loading to be done. I passed the first stage in my effort to become a British Swimming Judge Level 1 and am now a Qualified Timekeeper, pretty much all thanks to a lady called Jane. There was just the one very audible hiccup along my way. I’d donned my white kit and was poolside at Southbury Road. I’d had it explained to me twice what my role would be as guardian of my lane for the 1500m race. The second the distance came up I thought ‘Help, how many more than a lot of lengths is that?’ and scrambled to check on my phone. Of course it’s obvious, but if you’re at the end of the lane with the stopwatch in your hand you need to know for sure if it’s 60 lengths or not. I was stationed at the start / finish line / ‘evens’ end. My job, beyond timing, was to check turns were all legal, and to blow my whistle for a very loud and long time as the swimmer approached the turn into and out of length 58, to tell them they’re into the home straight. Clutching a lane countdown sheet, numbered down from 59, which was confusing as I was at the evens end, I was ticking the lengths off. Quick it’s time to blow I thought, how odd no one else is blowing, well I’ll just get on and BLLLLLOOOOOOW. I’m not sure why I peaked and blew two lengths early, but everyone poolside sure did hear my loud and long blast on the whistle. Mortifying, yes, very mortifying, yes. I didn’t dare ask the tired swimmer if I’d confused them. Lesson learned: work out your own system, and if you normally count up not down then do that. For the afternoon session – yes quite a full-on long day by the pool – I was mentored throughout by the best possible person. I know only that her name is Jane. She is fully qualified. She stood beside me through the racing peppering the afternoon with questions, what are we looking for in a butterfly stroke, what should we watch for on a breaststroke turn, is it legal to stop during freestyle (yes, but no steps may be taken). Mentoring is an essential part of training to be a qualified official, as a newbie you get to learn from someone who has days and weeks and years (not hours) of poolside experience, knows the rules backwards, and understands what’s an infringement and what’s not. Thanks also to the day’s referee who coached and coaxed me along as he questioned exactly when to blow the blooming whistle next time. I asked another club parent about mentoring and volunteering for the club, and he explained how he thought it was his way of giving back. Someone else’s parents or guardians have watched over your child at galas and at training, and here’s a chance to pass on your thanks through your own time. It’s very simple, if a club doesn’t field officials (qualified / trainees) then it can’t enter swimmers to race in a gala. Having been to many galas I’m very conscious of the need now to give back. But at the same time I have to remember that I have two children, not one, and a husband, and only two of the household are Really Into Swimming, and sometimes the footballing team need the car and we all need family time. Mentoring is all around us: in the workplace on a formal level, when you’re matched with A Mentor, and also at a very informal and unofficial basis with people – or perhaps one person – helping a new starter, showing them the ropes, guiding them as they start out in new surroundings, with new colleagues and unfamiliar systems. I’ve been really lucky embarking on my job to be guided along, no more so by the person who suggested, ‘Make a difference with little things before beating yourself up about big things’ and the other who told me it’s ok to feel a bit like a fish out of water as you start adapting and learning, as everyone does. At home I suppose we’re trying to mentor our kids through their transition into secondary school and beyond. When we’re not over-parenting or nagging that is. Autumn is most definitely with us, rain and conkers have begun to fall, and most importantly the temperature gauge at the lido is on its way down fast. I had the most perfect end of summer swim at the weekend in the enormous 60m by 27m pool at Gospel Oak which I had all to myself. No one’s limbs but mine breaking the surface of the water, no one to avoid colliding with and no one but me gazing at the silver stainless steel lining on the bottom. Heaven can be the Gospel Oak lido. 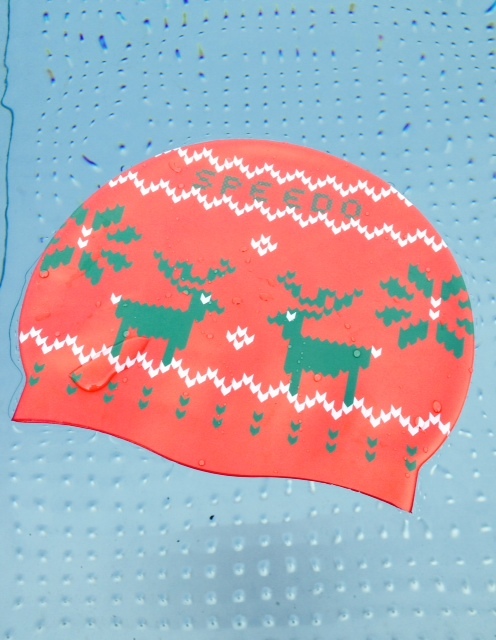 It was 16′ which is absolutely fine if you keep moving and are sporting a new festive swim cap like mine from Canada. I’m sure autumn’s a time for reinvention, why leave it all to January when you’re feeling bloated, depressed and cold? I’ve taken on new challenges, the first is very much in the spirit of #ThisGirlCan or perhaps #ThisMotherisGoingToTryTo and is to train for British Swimming’s Judge Level 1 qualification. This entails three classroom sessions: learning about time keeping, what’s a legal turn and what’s not, heaps more about correct strokes and watching videos when me the novice tries to spot what on earth the super slick swimmer could possibly be doing wrong. Then there are the practise sessions poolside – 10+ of these – when the trainees are let loose sans L Plates or even P Plates to time and watch and judge at real galas featuring highly competitive swimmers. You might imagine adrenalin is all kept to the guys diving off the blocks and pounding up and down, but oh no, I was overflowing with the stuff as I stood there all in white (eek, yes, white polo shirt, white jeans, white flip flops and *tangerine toe nails*) clasping the stopwatch in one hand and the back up button in the other trying not to press STOP or LAP or START prematurely. But before all that for each race you have to check the swimmer’s in the correct event, correct lane, correct heat, what their name is, what stroke they’re doing and how many lengths. That is a lot of checking, whether you’re talking experienced masters swimmers or enthusiastic and perhaps very nervy young ones. They just thrust their entry card at you, or put it on your clipboard, and if you’re not very careful you end up with a wodge of cards not knowing who’s who. (NB note to tutor: I will get better at this!) 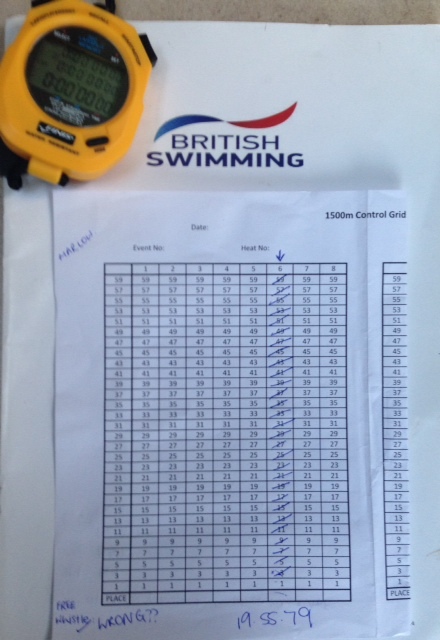 I bet I’m not the only trainee who’s panicked at a ‘200m IM’ thinking is that 200m of each stroke, or 50m of 4?? Woe oh woes it went pear-shaped twice. Twice I pressed the wrong button. It’s mortifying as you have to flag down a Proper Qualified Official who takes over timing your lane. But hey I am really enjoying this. I haven’t got a new qualification for so long, and this is fun, I’m learning rules, understanding systems and getting to grips with the world of competitive swimming which my daughter is so immersed in. The language of the rule book is quite particular, and takes some learning. My tutor was right, it was best to start with a Masters event (so adult swimmers) but I think you get wetter at them, try standing beside the blocks when a grown man dives in, whoosh down the legs goes half the pool water. The Proper Qualified Officials were so kind, one had laid on an enormous officials’ feast for lunch (I’m wondering what said feast etiquette is, is it an excuse for me to bake and take something along or would that be seen as currying favour at the start of my training? ), and some of the swimmers said thank you. But I’m very sorry to the team who asked if ‘are we going over’ for not knowing what on earth that meant (it’s a reference to diving over the top of swimmers in previous race) and hey to the medley team who apparently did an illegal handover but I couldn’t disqualify as I was too busy fretting about timekeeping I do know that the key to being an official is giving the swimmer the benefit of the doubt.